It’s that time of the year again. You know fashion season and with Pitti Uomo just ending it gives me the chance to show you some of my favorite trends spotted during the week long fashion event. Like last year, instead of only sharing street style images of others, I will try out the trends for myself and show you how I wear them. Today I’m talking all about the cape. Now there’s a couple of ways to go about wearing a cape. The most practical is by simply draping a coat over your shoulders. It’s not really a cape but the silhouette is still there and it utilizes pieces that you already have in your wardrobe. 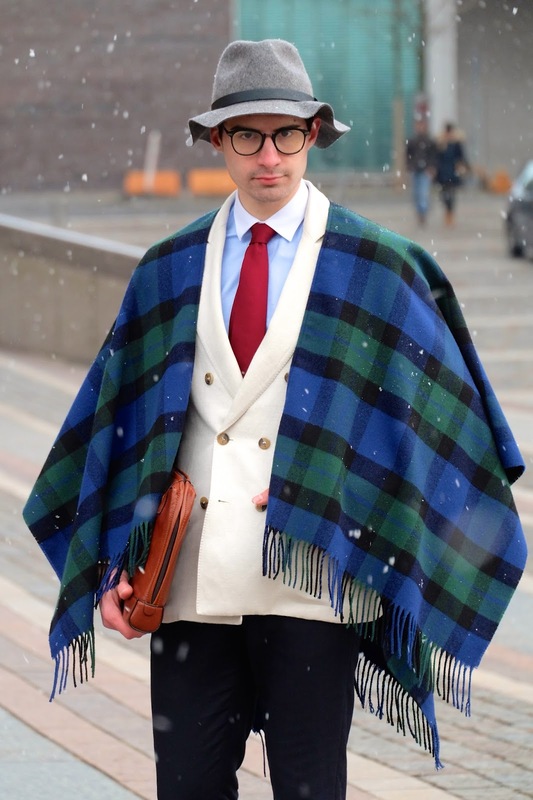 If you’re feeling a bit braver then go for a blanket style cape. It’s basically a blanket with the neck area cut out which allows for it to sit perfectly on your shoulders without slipping off. Capes like these can be found in most department stores but probably not in the mens section so don’t be afraid to peak around in the women's accessory area and do a little shopping for yourself. Go for something with a pattern such as black watch or larger tartan or a simple solid burgundy for a more elegant approach. What’s your thoughts on capes? Too feminine or just right? I am in LOVE with capes, except I don't currently own one, and it's totally impractical here in Singapore. Love your look here though! So snazzy. I don't think it looks too feminine, I love the check pattern!